Wild skunks don't make good pets, but hand-raised domesticated skunks can be entertaining, docile and loving. Skunks are omnivores who will eat just about anything. In the wild, skunks are prone to scavenging through garbage, and the diet can be quite eclectic. But in captivity, you want to ensure a varied healthy diet. Skunks should be offered a variety of proteins; meats and dairy should total about 60 to 70 percent of the diet. Chicken and quail eggs can be offered raw, boiled or scrambled -- with or without the shell. Offer raw chicken or marrow bone once a week. Canned salmon or sardines are favorites, but you want to avoid can tuna. Cheese is a great source of protein and vitamin D. You can offer crickets, mealworms, super worms and frozen pinkie mice. Hulled seeds and raw nuts, such as almonds, lindseeds, sunflower seeds, pumpkin seeds and pecans are high in proteins and fats. Vegetables should be 30 percent to 40 percent of the diet. You can offer a wide range of vegetables and greens. Offer most vegetables raw or frozen. Choose from broccoli, cauliflower, yellow squash, zucchini, bell peppers, green beans, snap peas, carrots, egg plants, radish, turnips, beets, cucumbers and tomatoes. You can cook and offer potatoes, sweet potatoes, yams, butternut squash and acorn squash, but only offer these items a few times a month, and only after cooking them. Limit bean sprouts. Healthy greens that you can offer include red cabbage, spinach, kale, romaine lettuce and endive. Fruits are safe and healthy to offer a captive skunk. Skunks love berries -- raspberries, blueberries, blackberries and strawberries -- but offer cranberries only occasionally. Other fruits that you may offer include pears, apples, bananas and melons. 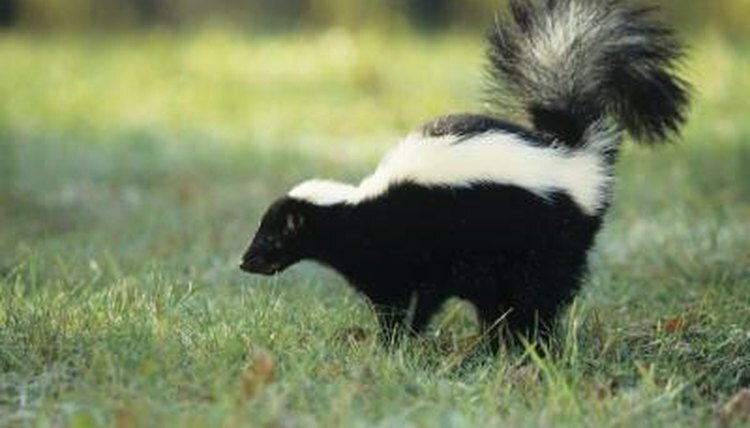 Fats and fatty acids help maintain a skunk's healthy skin and coat. Nuts, seeds, poultry, soybean oil, extra virgin olive oil and coconut oil will help provide fatty acids and omegas. You want only about 25 percent to 30 percent of calorie intake to be from fats. A varied diet will provide essential vitamins and minerals; get your vet's input if you think supplements are needed. For supplements, visit your local wholefoods store instead of offering supplement products designed for general captive pets. Calcium is essential for many body functions, as well as bone growth. Skunk Vet Care says a captive skunk can suffer low bone density, bone spurs, arthritis and fused bones when calcium supplements are offered without other sources of calcium, such as raw chicken neck or cheese. Vitamin D is essential, often consumed naturally in eggs, fish and fortified dairy. If your vet OKs it, offer a 100 IU dose of D3 at least four times a week. Taurine is a non-essential amino acid, but if you offer a low-protein diet, a taurine supplement may be necessary. Most pet skunks live only about five years in captivity, but their natural life span in the wild should be at least 10 to 15 years. Without a healthy diet, pet skunks often suffer from obesity, diabetes, kidney disease and cancer. A healthy, varied diet will reduce the risks of these nutrition and diet-related illnesses. Avoid processed foods and dog/cat kibble.